After initial contact, we will conduct a site survey to understand your site requirements. 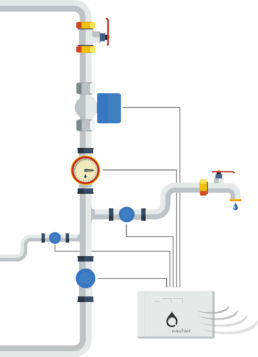 We will provide you with a tailored solution to detect leaks and reduce bills. Our network of expert installers will ensure a smooth installation of the smart meters and other water saving products. You will gain access to bespoke reports and alerts for your building showing return on investment and immediate feedback on progress. The bespoke reports will recommend exactly where water is being wasted and the payback period to rectify the issues. All buildings are unique. That is why we provide bespoke solutions are created around your needs. Depending on the nature of your business and level of detail you require, just one of our sensors may be enough. We can even retrofit LeakNet onto existing water meters that you may already have! With fully customisable settings for each individual sensor, you can ensure you are getting the right level of protection. Note that a WiFi connection is required for wireless communication, and a nearby plug socket is required for power. 1. Find the stopcock, where the water enters the area/property. 2. Optional: choose a valve and install it just past the stopcock. 3. Choose a water meter or water sensor and install it just past the stopcock. 4. Optional: install up to 3 more sensors on other branches. 5. Wire the sensors, valve, and power to the base. 6. Connect the base to your WiFi and enjoy using LeakNet in the cloud.